Let them see YOU in Me! In light of our focus this week on Self Control, this song seemed appropriate. If we have self control, self discipline, and a sound mind, people will see Jesus in us! Be a reflection of Christ in all you say and do! It could change somebody’s life. We are called to be light in this world! 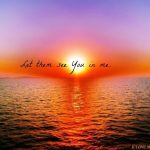 Be the light and let them see God in You!